Chlorophyll-a is the pigment that makes plants and algae green. This pigment is what allows plants and algae to photosynthesize. In photosynthesis, plants use the sun’s energy to convert carbon dioxide and water into oxygen and cellular material. Chlorophyll-a is tested in lakes to determine how much algae is in the lake. Algae is important in lakes because it adds oxygen to the water as a by-product of photosynthesis. On the other hand, if there is too much algae in a lake it can produce a foul odor and be unpleasant for swimming. Chlorophyll-a concentration can tell you a lot about the lake’s water quality and trophic state as shown below (Figure 1). We can compare annual mean chlorophyll-a values to see if the amount of algae in the lake per year is increasing, decreasing, or staying the same. The amount of algal growth in a lake depends on many factors, including water transparency, water temperature, predation by zooplankton, and the availability of nutrients, (especially phosphorus and nitrogen). There are natural seasonal variations in algal concentrations. In the spring, the water is transparent, and there are many nutrients available due to the spring turnover; however, the water is not very warm yet, which limits algal growth. As the water warms throughout the summer, algae grow to higher concentrations. 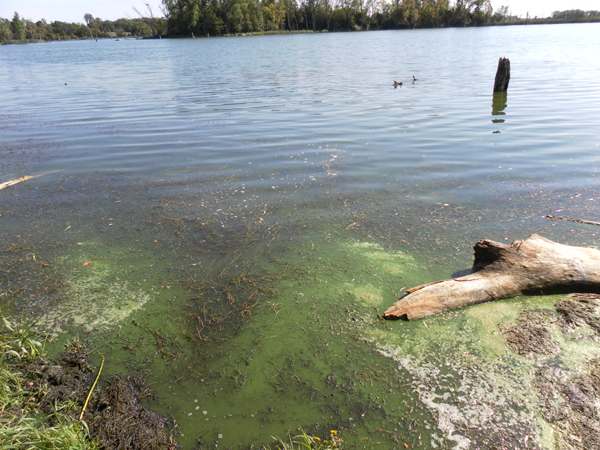 When there is a heavy rain more nutrients get washed into the lake, fueling an algal bloom. As the algal concentration increases the water transparency decreases. This means that less light can penetrate through the water so the algae are only at the very top of the lake where there is enough light for photosynthesis. In late summer, the algal community is dominated by cyanobacteria (blue-green algae). Cyanobacteria can become very thick and have a foul odor as it decays. When algae die they sink to the bottom of the lake and get decomposed by microbes and invertebrates. This decomposition process uses up oxygen. In eutrophic lakes where there is a lot of algae, there needs to be a lot of decomposition and all the oxygen at the bottom of the lake gets used up. When this happens, the fish move up to the shallower areas of the lake where there is still oxygen available (more information on fish).